A very good quality compass cane set into an ivory case with ivory top. Completed with a lower highly decorated white metal collar. The ivory top holds a carved and stained monogram that is too worn to clearly define. The shaft made from what appear to be beech and completed with an ivory ferrule. 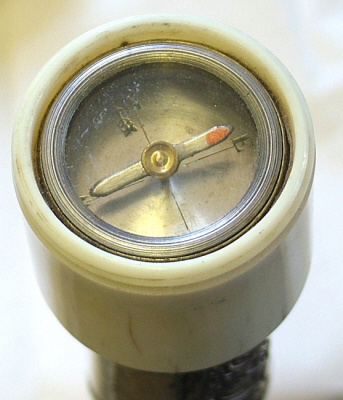 The cane has only one ivory chip on the underside of monogrammed compass top that can only be seen when the top is viewed from below the cane or when the compass top has been removed. The base ivory ferrule holds a minor expansion line, which evidently has been in place for a number of years. Otherwise the cane is in excellent working condition, yet showing the appropriate wear for age.